At the beginning of the 21st century the Responsibility to Protect emerged and developed into a norm in world politics, from its birth in the report of the International Commission on Intervention and State Sovereignty, to its adoption by a World Summit of political leaders in 2005. It was hailed as superseding the concept and practice of humanitarian intervention in international affairs, which was dogged by its dubious legal status – falling outside of the UN Charter’s specification of the legitimate use of force – and the lack of any established principles and codes. R2P, with its three pillars, four international crimes, and legal standing settled all those uncertainties, and we could declare: Humanitarian intervention is dead! Long Live R2P! However, what we are coming to realise is that any such declaration is premature. I do not want to make the opposite mistake of declaring R2P to be dead, although it is in a very weak condition. But the fact is that humanitarian intervention is alive and kicking as a concept and practice in international politics. R2P has its three pillars: of national responsibility to protect human rights of populations; of international responsibility to support nation-states in their efforts to do this and so prevent mass atrocity crimes; and of international responsibility to militarily intervene in extreme cases to prevent genocide, crimes against humanity, war crimes and ethnic cleansing. The key strength of R2P was that it would ensure any actions under the third pillar were legally sanctioned by the UN Security Council, but it is here that R2P is at its weakest. There is much work being done, and many Security Council resolutions being passed, under the second pillar of prevention – which is why R2P is far from dead – but deadlock in the Security Council after the NATO intervention in Libya means it is unlikely that any military interventions on this scale will fall under the legal scope of R2P in the foreseeable future. This is where humanitarian intervention arises from what might have seemed to be its grave, because states are intervening military in the territory of other states in order to prevent atrocity crimes, and as R2P is unavailable to them, they are increasingly turning to humanitarian intervention as their justification. A key example is the intervention of the United Kingdom – along with France and the United States of America – in the Syrian conflict. In April 2018 the UK and France authorised air strikes against military targets in response to the suspected use of chemical weapons by the Syrian regime in Douma. 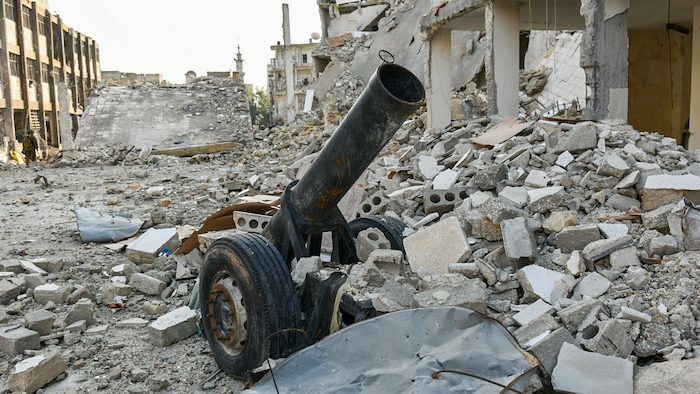 These were aimed at the Syrian regime’s chemical weapons capability and aimed at deterring further chemical attacks in order to avert a humanitarian catastrophe. The government’s published legal position on the air strikes cited humanitarian intervention as the legal basis for the response – the aim was exclusively to avert humanitarian catastrophe caused by regime’s use of chemical weapons. What is key here is that the government argued that this kind of humanitarian intervention – outside the scope of R2P and the Security Council – is compliant with international law. The key argument was that the creators of the UN would not have expected that the prohibition of the use of force in their Charter would be applied to prevent states from protecting civilian populations and stopping mass atrocities. In other words, we need to interpret the intentions of the authors of the Charter, and if our interpretation is that they did not intend to make humanitarian intervention to prevent mass atrocity crimes illegal, then it cannot be illegal. The proposed use of force must be necessary and proportionate to the aim of relief of humanitarian need and must be strictly limited in time and scope to this aim (i.e. the minimum necessary to achieve that end and for no other purpose). But if these conditions are met, the use of humanitarian intervention is consistent with international law. Where this leaves R2P is unclear – as I said earlier, I do not want to declare it dead. But when it comes to military action to prevent mass atrocity crimes, it does seem that key players in international politics have abandoned it. Long live humanitarian intervention!